Grab a pot of tea folks, get comfy, you are in for a good read…. The WTS finally arrived in Leeds over the past weekend (in case you had not noticed!) and what another fantastic show Yorkshire put on (1st one being the Tour de France!). The atmosphere on Sunday morning in the city centre was a happy electric. Conditions were a little humid, damp in places, slippy on the roads in some places. If the elites do not mind we will crack off with the age groupers first as they were out the blocks first. And if the men do not mind we shall start with the ladies first as always should be the case. Chloe Scotchbrook and Claire Pickersgill wowed the crowds in their eye catching Jackpot kit over the standard distance course. Chloe had the 3rd fastest swim of the entire ladies field and Claire had the 5th fastest bike of the entire ladies race! 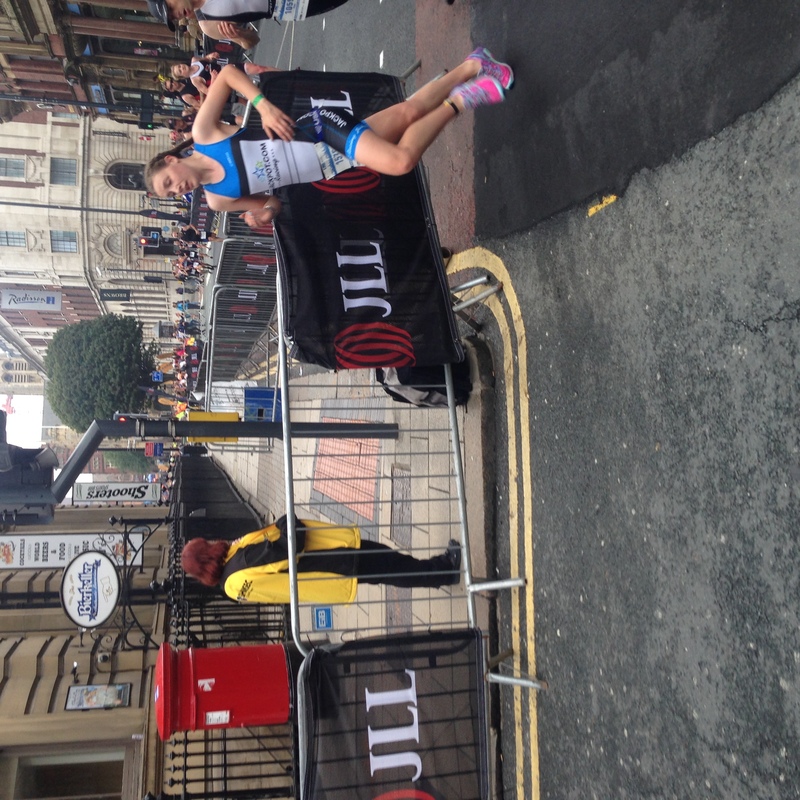 Chloe finished as 7th lady overall and 2nd in her age group (20-24) – a triumph indeed! Claire finished as 20th lady and 5th in her age group (30-34) – we have since had a chat about her run…not sure what happened there but it was agreed it would not be repeated 😉 TREMENDOUS going ladies, absolutely tremendous. Onto the men and we had one Jackpot athlete in the sprint distance. 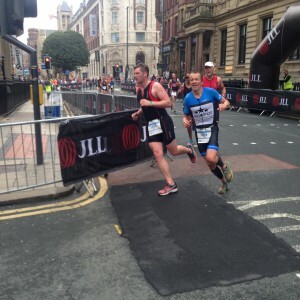 Richard Knell-Moore clocked a 20th overall and bagged a 1st in his age group! This is just immense! But it did not stop there! Tim speeding to a podium! The Royal wave from John! Onto the elites! Jess Learmonth we love your style! 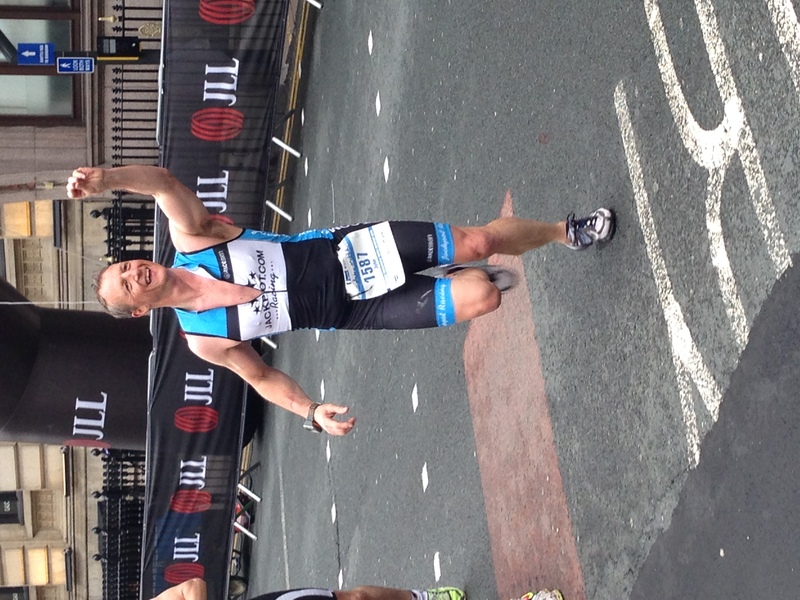 1st out of the water, 1st on the bike – by golly did you work hard on the bike! It made for fantastic watching (thank you!). 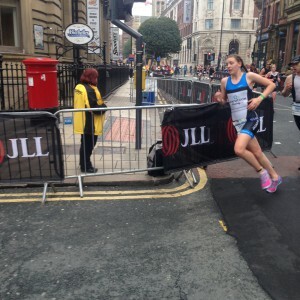 Jess finished 10th overall – TOP TEN! Three and a half minutes behind Gwen Jorgensen – BRILLIANT! Adam Bowden and Tom Bishop in the mens race (and what a race!) gave it their everything. The adrenaline was seeping through the television into people’s lounges – spectators including me are still buzzing now! 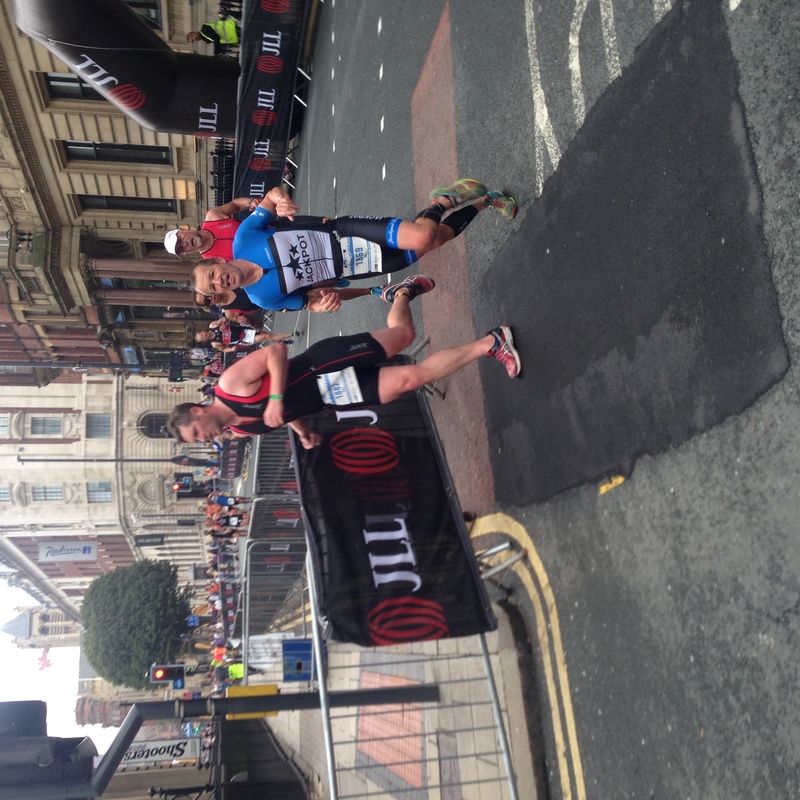 Adam finished 7th overall just two minutes behind Alistair Brownlee with a run of 31 minutes (!!!!!!) and Tom 20th overall just 3 and a half minutes behind Alistair with a run just under 34 cracking minutes. You must be pleased with those performances boys – again, wonderful racing and wonderful watching. 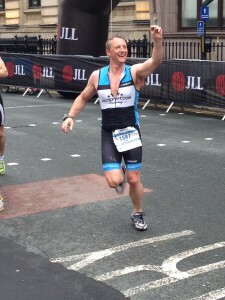 ‘On Sunday I completed my first middle-distance duathlon which is what I’ve been training for the past few months. The race, known as ‘The Little Pig’ is a shorter version of the Pig Ultra Duathlon organised by Brutal Events. The race consists of a 6 mile mountain run, 55 mile rolling bike route and a 10 mile hilly trail run. The race began at 7am with what was meant to be a 6 mile run (3 miles up, 3 miles down) up to the summit of Cadair Idris and back to transition. However due to rain and thick cloud cover the run had to be shortened to about half a mile from the summit so ended up being about 5 miles in total. I got to the turnaround in first but knew I might struggle to stay in front on the descent. The rain made it very tricky descending on wet rocks with some very steep sections. One of which I lost control on and up running off course through some heather and somehow managed to avoid falling or hitting any big rocks. Just after this I had one minor fall but nothing serious. I got back to T1 in second place about 40 seconds behind the leader. The bike route was mostly all on main roads but with it being so early there wasn’t much traffic. It was mostly rolling hills which suited me. For most of the first half there was a tail wind but I managed to regain the lead about 10 miles in. At this point the rain started to get heavier and it was really pretty grim, lots of surface water and poor visibility, also regretting not putting on an extra layer in transition. The last half of the bike was mostly into a headwind with more uphill, which was tough but probably helped me build up a bigger lead. Everything seemed to be going ok until about 5 miles from T2 when I got a front puncture. Decided to carry on in the hope I’d have enough time in hand to still be in with a chance of the win. Managed to crawl back to T2 riding on the rim of my front wheel, strongly not advised. I was still in the lead but had no idea by how much. Started the second run and felt pretty good, still couldn’t see second place so I was confident I could hold on. However as soon as the run went off road I got a bit worried as there were no marshals at all and was relying on spotting arrows which was tricky in fog running through a mixture of fields and off-road paths. In the end I managed to hold on and actually extended my lead on the second run to just over 7 minutes. Longest event I’ve ever done and by far the toughest. And that ends this week’s news!